We’re being hit with a double-whammy: Wages are under deflationary pressure, and almost everything else is exposed to inflationary pressure. Now that prices for commodities such as oil and grain are set on the global market, local surpluses don’t push prices down. If North America has record harvests of grain, on a national basis we’d expect prices to fall as local supply exceeds local demand. But since grain is tradable, i.e. it can be shipped to other markets where demand and thus prices are much higher, the price in North America reflects supply and demand everywhere on the planet, not just in North America. If we put ourselves in the shoes of a farmer or grain wholesaler, this is a boon: why sell your product for 1X locally, when it fetches 2X in other countries? You’d be crazy not to put it on a boat and get double the price elsewhere. As the share of the economy exposed to digitization increases, so does the share of work that can be done anywhere on the planet. When work is digitized, it is effectively commoditized, meaning that it no longer matters who performs the work or where they live. If people in countries with low wages can perform the work, why on Earth would you pay double to have high-wage people do the work? It makes no sense. Taking advantage of the differences in local pay scales is called labor arbitrage, as the employer is trading on (i.e. arbitraging) two sets of prices. It’s not just labor that can be arbitraged: currency, interest rates, risk, environmental regulations, commodities–huge swaths of the global economy can be arbitraged. The basic idea of the global carry trade is to borrow money cheaply in a currency that’s weakening and use the money to buy low-risk, high-yield assets in currencies that are gaining in relative value. It’s a slam dunk arbitrage: not only does the trader earn an essentially free return (borrowing yen at 1%, for example, converting the yen to dollars and buying Treasury bonds paying 3%), but there is a bonus yield on the dollar strengthening against the yen: a two-fer return. Global labor is in over-supply–one reason why wages in the U.S. have been declining in real terms, i.e. 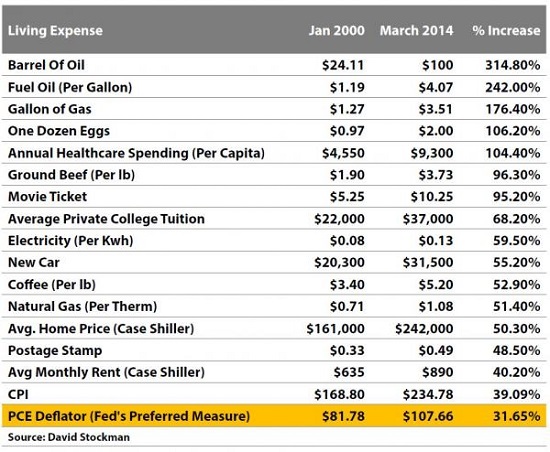 when inflation is factored in. The better description is purchasing power: how much can your paycheck buy? A former Union City, CA superintendent took home more than $600,000 last year, making her the top earner on a new online database tracking salary and benefit information for California public school employees. Note that this doesn’t mean that healthcare costs rose along with wages–it means a larger share of our earnings is going to healthcare than ever before. 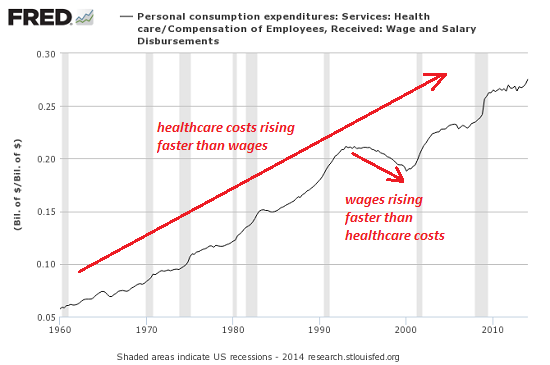 Other than a brief period in the 1990s when productivity gains drove wages higher, healthcare costs have risen faster than earnings every decade. The consequence is simple: the more of our earnings that go to healthcare, the less there is for savings, investments and other spending. In a way, we’re being hit with a double-whammy: whatever can’t be traded, such as the local school district and hospital, can charge outrageous fees and pay insiders outrageous sums for gross incompetence, while whatever can be traded can go up in price based on demand and currency fluctuations elsewhere. Meanwhile, as labor is in over-supply virtually everywhere, wages are declining when measured in purchasing power. Wages are under deflationary pressure, and almost everything else is exposed to inflationary pressure. No wonder we feel poorer: most of are poorer. This entry was posted in news and tagged central planning, crash, currency wars, depression, dollar collapse, economic collapse, Economic Crisis, Fed, fed policy, globalization, Gold, health care, palladium, platinum, poverty, precious metals, silver, third world, Unemployment on October 30, 2014 by Site Admin.